During a recent trip to the Alps the heating system in the van failed overnight when it was -15degC outside – we woke to find it was 1degC in the van, cold air being blown from the heating vents and the fresh water had frozen! Below are some details about how the Truma blown air heating system works, and how to perform some basic diagnostics. This might get you out of trouble but remember that messing about with gas appliances is inherently dangerous, get something wrong and you may gas yourself, blow your van up, or worse! – only work on your system if you are confident and competent to do so….. Surrounding the exhaust gas heat exhanger fins are another set of heat exchanger fins, though these are sealed from the customer gasses. For blown air heating air from inside the van is blown over these fins by a larger fan to heat it up before entering a manifold at the bottom of the boiler where it is blown out through the four hot air distribution ducts. Finally surrounding these heat exchanger fins is a 12 litre water jacket, and heat energy from the combustion chamber not extracted by the blown air heating ends up in this jacket, heating the hot water. There are some switches to select between off/hot water only/hot water and heating & for selecting the hot water temperature, a thermostat knob for setting the room temperature and some lights to let you know what is going on. In our case when we woke in the morning there was no red light on the controller and the combustion and room fans were still running, suggesting the boiler thought everything was fine – the flame had clearly gone out though!. I reset the system (turned it off and on again! ), the boiler attempted to start but went to a lockout state (red light) shortly afterwards. Note: if you have the control panel set to heating and hot water the room fan will run also. The same sequence of events above will still happen but the noise from the room fan makes it harder to hear what is going on! First things to check are is the gas still working (checking the hob is the easiest) and battery voltage. Our hob was working fine and the battery was reading 11.9V so it all looked OK. Note: Butane gas will not vapourise below about 3degC so Propane is required for cold weather use, we were in the mountains in the winter so had two 11kg Propane cylinders on board. Our system seemed to have developed multiple faults all at once, sometime the gas would light but the ignitor would then start firing again (even though the boiler was still lit) suggesting the boiler thought the flame had gone out. Occasionally it sounded like the gas solenoid hadn’t fired at all (suggesting either a defective solenoid or defective driver circuitry). Sometimes the system would run but then the room thermostat became unresponsive (the system would shut off when the van got up to temperature but then not re-start when it cooled down). 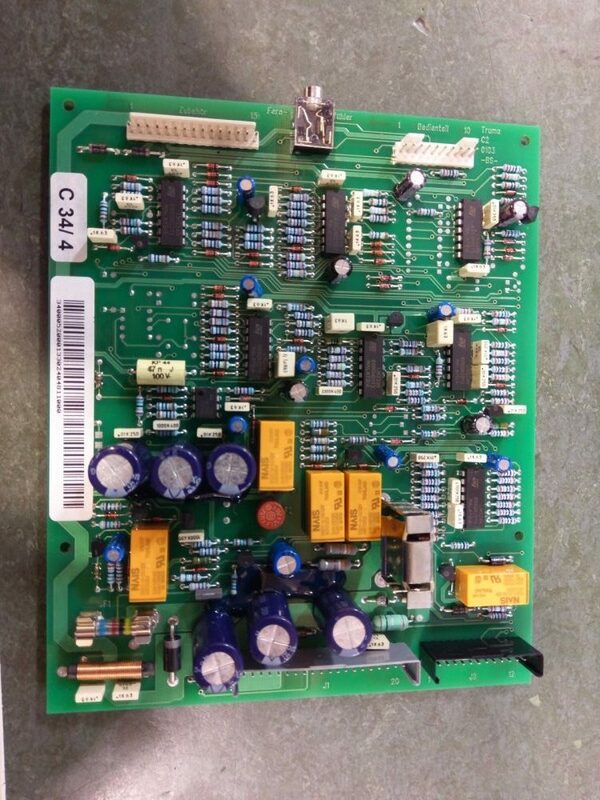 To me this pointed to a defective PCB (main control board) – as this was the only component I could think off that could cause so many of these symptoms. Either way it was time for a strip down and inspection to see what was going on, the unit had been rattling around in our old bus for the last 18 years after all and we’ve got no record of it ever being serviced! 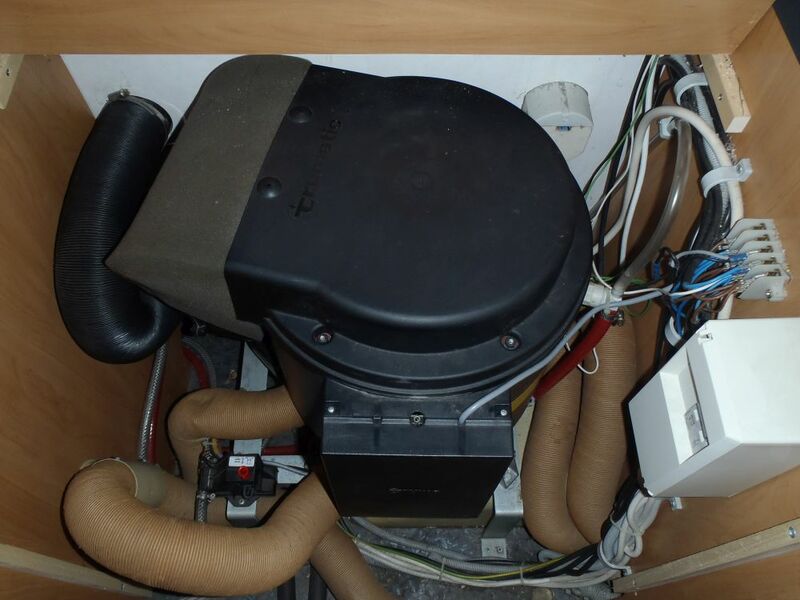 You can also see the 240V inlet (white unit in side of van behind boiler) and 240V distribution box (white box in bottom right hand corner of picture) – but these don’t have anything to do with the Truma system! 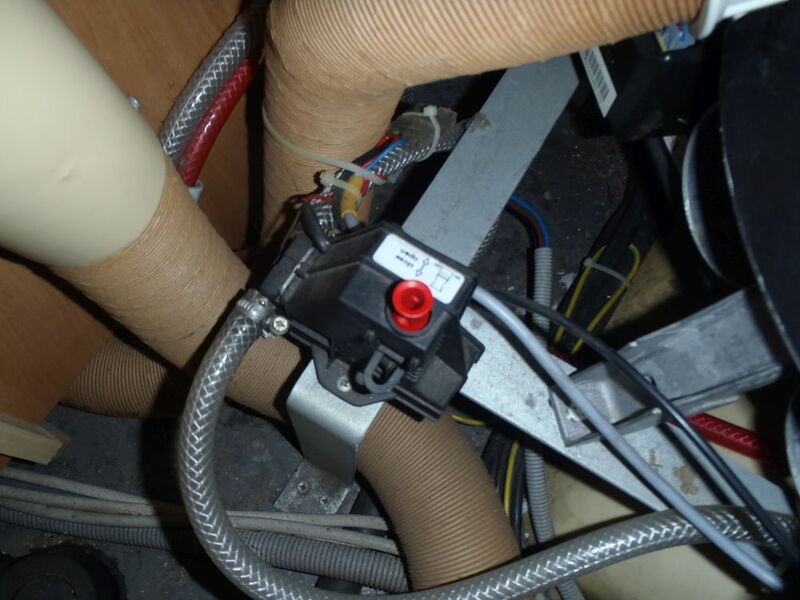 The small black box with the red knob on it (between the two left hand hot air ducts) is the frost protection valve. This is connected to the water system and opens if the temperature in the van drops below about 4degC, emptying the contents of the boiler out underneath the van. This is to prevent the boiler freezing with water in it causing the hot water cylinder to crack. This vale is held closed electrically so if you disconnect the habitation batteries or blow the fuse supplying 12V to the heater it will open and drain the boiler. Once it has activated it has to be manually reset by pulling the red knob upwards (if you need to keep it closed temporarily but the temperature in the van is too low to allow it to latch a clothes peg can be used to hold it closed, don’t forget to take it off once the van has warmed up though!). Here you can see the central can housing the burner/combustion chamber, the outer heat exchanger fins that the room fan blows air over and the hot water cylinder on the outside. 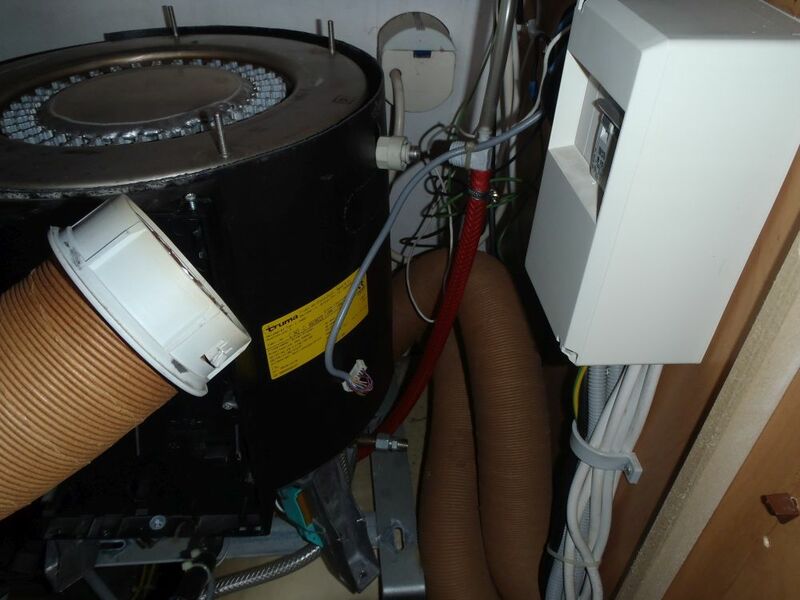 With the fan housing removed you can get down the back of the unit to disconnect the flue – warning: it can be difficult to get it reattached and you are supposed to use a new o-ring on the exhaust connection whenever the flue is re-attached so I don’t recommend disconnecting it unless you have to. I disconnected it to check for excessive soot etc. in the exhaust which would point to a combustion problem, but it was all clean in my case. To get access to the burner assembly you now need to move the whole unit. First job is to disconnect the hot air ducts – unfortunately they are held in place with little plastic tabs top and bottom that have to be depressed to withdraw the duct, and the top tabs are almost impossible to access with the unit assembled (it doesn’t appear to have been designed for disassembly!). I opted to just remove the front two duct hoses (which involved breaking the top tabs on each one) and leaving the rear ducts connected. It meant I couldn’t remove the whole unit from the van but I could at least turn it on its side to work on it. 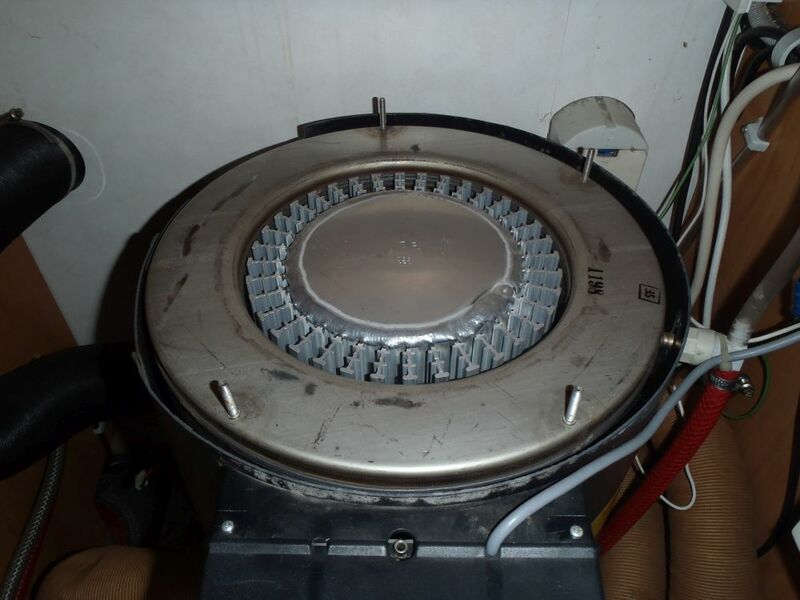 The burner assembly can now be seen held into the bottom of the unit by three 8mm nuts. To remove it you need to take the gas valve/solenoids off (held on by two screws, it has already been removed in the above photo but it would have been attached to the burner behind the water hose at the bottom of the photo). You also need to unscrew the combustion fan air feed ducting (black plastic housing in the middle of the photo) – there are three screws that attach this to the burner, two are obvious but one is hidden inside the ducting to get to it you need to remove the air flow sensor from the ducting (the little pcb you can see next to the ducting in the photo above). With this removed you will be able to see the screw inside the ducting, a feed a long screwdriver down through the mounting leg and into the ducting to remove it (see photo above – I left the screwdriver in to make it clear!). I believe you can buy new electrodes separately and they should be easy to fit once you have it all apart like this, but I found a good deal on a whole burner assembly so I decided to replace the whole thing. Note – it looks like the boiler uses ‘flame rectification’ to detect if a flame is present, and the electrodes in these systems are very sensitive to dirt/corrosion on the electrode. It is entirely possible that just cleaning up the electrode with fine wire wool would have fixed the problem, but after getting this far into the guts of the unit I didn’t fancy trying it in case it didn’t fix it and I had to pull the whole lot apart again…….. I also decided to replace the PCB as I found one for a good price. It’s actually from a later version of the C3402 and not completely identical, but looked close enough that I was willing to risk it! (all connectors are the same and most of the circuitry is identical, some of the components have been moved around a bit and the relays are from a different manufacturer. There is also a few additional components the original board didn’t have, which I think are to support some remote start functionality). With it all back together with the new parts everything seems to be working OK again – we’re back off to the mountains in a few weeks so I’ll update this if any of the faults reappear, or if it develops any new ones! Hopefully this information has been useful – if you have any questions or comments please leave them below……. “I had a “Blow Back” with my Trumatic C 3402 which blew the end off the external plastic cowl… I found the broken pieces and glued it back together for a temporary fix. … Boiler would not stay alight afterwards and “lock out” red led would come on….. it would light but only for 10 seconds max then shut down…. I replaced the flame detection electrode but still no fix…. turned out to be the flue pipe had sheared off where it connects via a clamp to the external cowl…… this caused the gas and air mix to be wrong therefore putting system into Lock down. UPDATE #2! – A reader is having some problems with a Truma roof cowl, if you have any experience with the roof mounted vents/cowls please take a look here and see if you can help! UPDATE #3 – No hot water from your boiler? 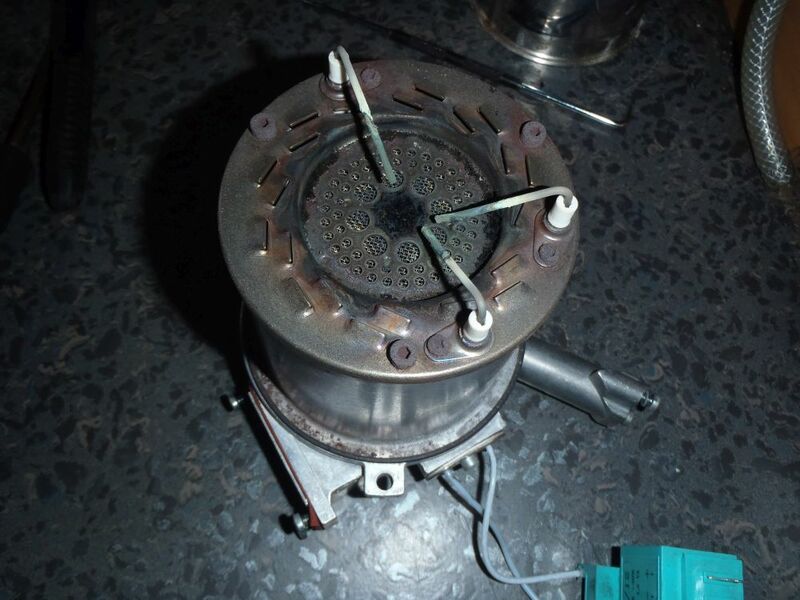 – click here to read how a Motor-Roam visitor diagnosed and fixed the problem……..
No problem Barrie! Thanks for the feedback! My Sister has this system on Laika Ecovip. On doing some work on the roof, I noticed that a cowl had been fitted to the external pip that was not giving cover for water ingress. It looked like the common Trumu chinese hat model that is on my old caravan. I ordered up the “proper”? cowl from Leisuredirect. It has the straight sides and the arrow for pointing to FRONT. I think there is still something missing though, like a spacer collar. Perhaps this one blew off too and bits got lost? Even this new cowl looks to have a smaller dia than the service pipe on the roof? How can it shed water over the pipe, when it has no overhang? Thanks a lot Dan. I will get a few pics up. I have searched google images for weeks, and I cannot find an image of the real life cowl on the roof. I have studied the drawings, which led me to buy the cowl that is shown. Hi Alex – I got your e-mail but the reply bounced back? Anyway – I think the gap around the larger tube is the air inlet and the hole you mentioned is for a screw, possibly to fix an outer case that has gone missing? That said I’ve not seen that type of cowl before so I’m guessing! I’ll post the pic up on here and see if anyone else can shed any light on it! I am guessing that the largest pipe should be watertight, but not air tight. The cowl provides an outlet for gas fumes only, through the inner stainless flue. The other tube that contains that exhaust duct, must draw air through the actual exterior pipe chamber, not the roof cowl itself. If anyone has a pic of a set up with the plastic cowl on the roof, which is semi square, that would be great! Fantastic. Hope I don’t need it, but thank you. Thanks for the positive feedback David! Hi Dan, thanks for the very good write up. 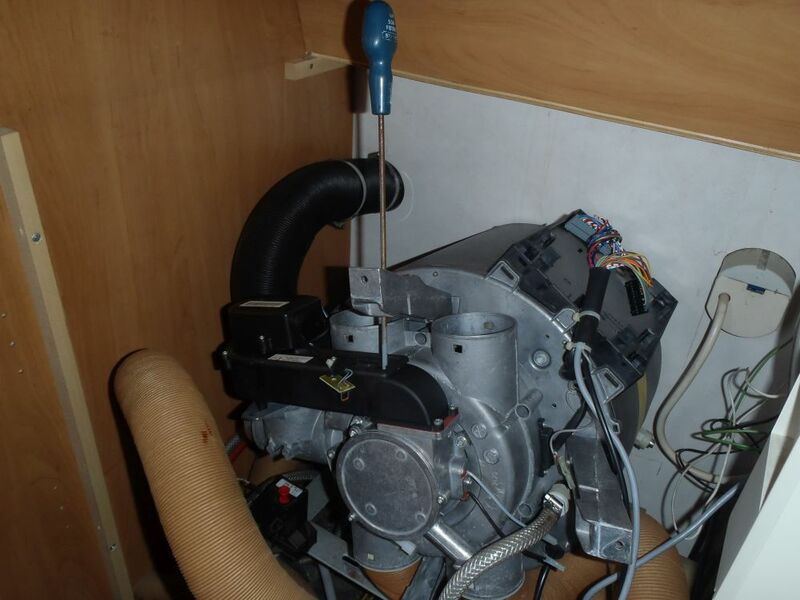 i have the same boiler in my Hymer and i’m plucking the courage up to tackle it. But the hardest thing for me is the fault diagnosis. I like you don’t have a massive stock room of parts and buying parts to replace what might be wrong would be expensive. So heres the million dollar question. My boiler goes through all the usual start up procedure, 1 combustion fan running 2 gas solenoid clunk 3 ignitor clicking away 4 the muffled whump of the gas igniting BUT it does this the muffled whump three times and then the red lock out light comes on. So the gas is refusing to stay lit. Could this be the flame rectification electrode? I hope i’m right and that you can verify this for me then i can buy the offending part and replace it. Great article: thank you. My heater unit has simply gone dead from the control/thermostat end, with no lights showing whatsoever. Have obviously checked the basics, including voltage testing each connections into the control panel… but no readings whatsoever. I have recently purchased a 1998 Hymer Starline in need of of some all round TLC. I have decided tackle the operation of the boiler first. Maybe someone could give a newbie a steer in the right direction! Up on filling the boiler with the taps open the air will purge through and the water will start to come out, however it will also start to come out of what i believe to be the hot water connection and vent valve? 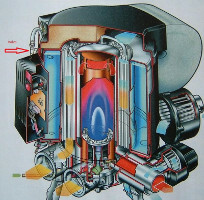 (It looks like it the valve labelled in red on the above cross section diagram.) Any help or advice greatly appreciated. Hi Gordon – the vent valve on the photos above has a clear hose coming out of the top, with a red hose coming off the underside. The red hose is the main hot water outlet from the boiler, so when you are filling the boiler the water will flow through the red hose once the air is purged. If it is flowing out of the clear hose it suggests the vent valve has failed (this is an over-pressure vent, from memory). If water is coming out of the frost protection valve (will usually drain out underneath the van) then the red knob needs pulling back up to shut the valve – note it is held closed electrically so if there is a supply problem to the valve the knob will not stay in the ‘up’ position. Thanks for the comments – It’s a good sign that the water heating side is working OK as this means all the gas control/safety stuff is working OK. If it’s not running the room fan it could be an issue with the thermostat or the fan control speed control stuff on the PCB. In an emergency you could probably power the fan directly as this will take heat out of the system and when the water drops below the set temperature the boiler should fire itself back up to heat the water – not as well controlled as when it is working properly but at least you would get hot water and some room heating!. The replacement PCB is working fine in my unit despite being slightly different than the one that came out of it. 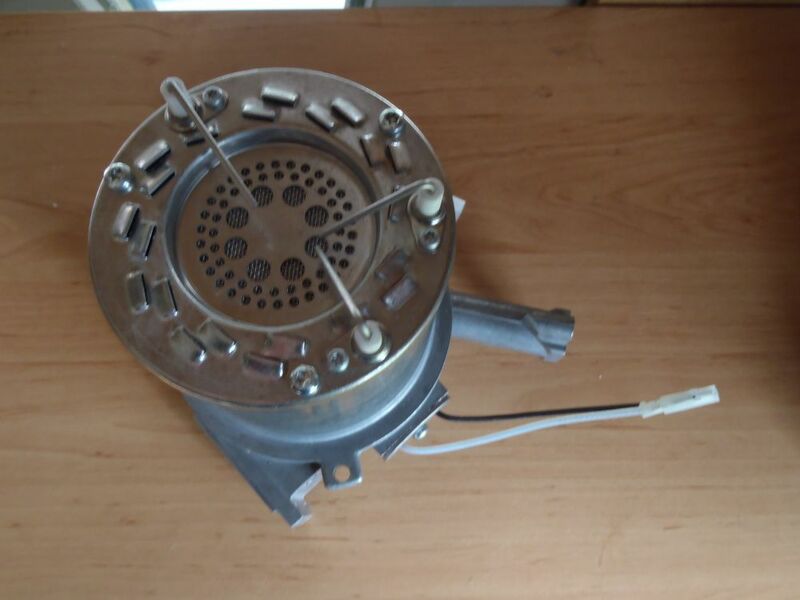 The part number was 34000-77000 and it came from Yorkshire Coast Caravans but I think it was old stock they found lying around rather than a part they normally carry in stock. Truma have an online service portal at https://www.truma.com/uk/en/service/service.html and they are quite helpful so should be able to help you source a new part – it is likely to be quite expensive though! Hope you get it sorted, let us know how you get on….. I had a “Blow Back” with my Trumatic C 3402 which blew the end off the external plastic cowl… I found the broken pieces and glued it back together for a temporary fix. … Boiler would not stay alight afterwards and “lock out” red led would come on….. it would light but only for 10 seconds max then shut down…. I replaced the flame detection electrode but still no fix…. turned out to be the flue pipe had sheared off where it connects via a clamp to the external cowl…… this caused the gas and air mix to be wrong therefore putting system into Lock down. Hope this may help any other “have a go” repairers. All the best Marcus. Hi, this is a very informative article about the truma c4002. my c4002 has stopped working and shows a fault red light as soon as I switch it on. no fan noise or clicking. gas supply is ok.
Can I ask do you know if the grubscrew on top of the pcb board is needed as there is none on mine. It might be my problem but I am not sure. 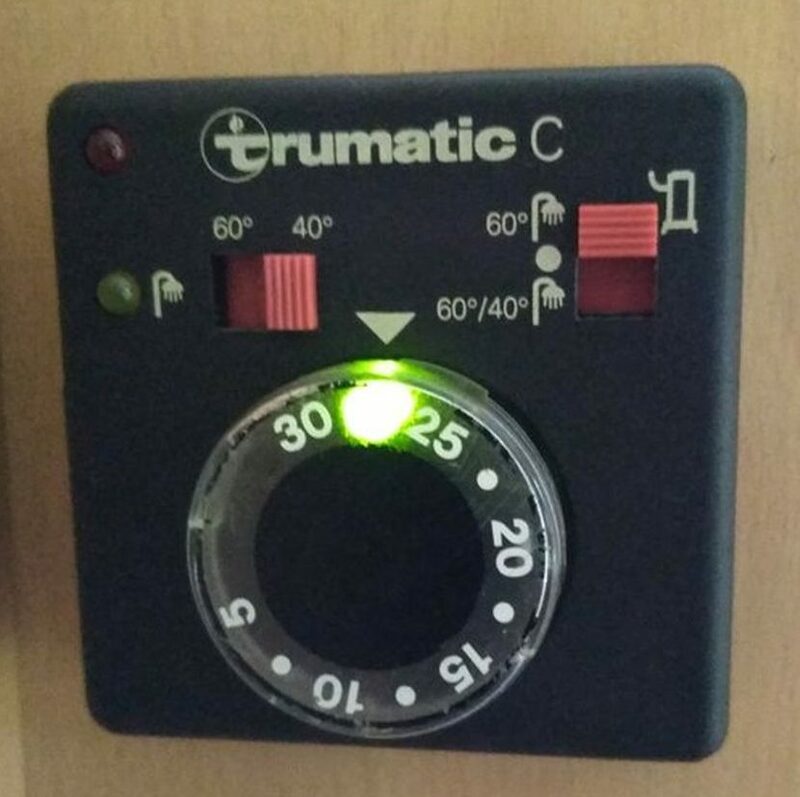 If the light immediately goes red the first thing I would look at is the combustion fan (as starting this fan is the first thing the boiler does) – check the simple things first – has it become disconnected?, has it seized up?. If all seems well you could try measuring the voltage to the fan to see if the PCB is sending power to it. 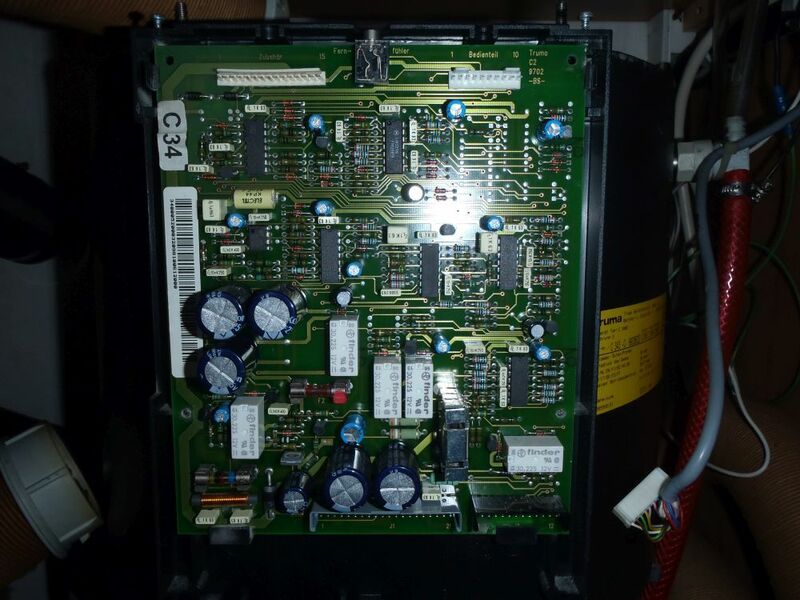 Hi Dan, i have a Eura Mobil van 2003 with the Trumatic C 3402, I am in the Midlands, it sounds very much like the problem i have, Sometimes the boiler will fire up for hot water, but when i switch to Heating, it goes through the process where you can hear it trying to fire up, it usually makes a clucking sound 3 to 5 times before the red light goes on. I was in Italy recently and they were asking close to 1000 Euros to fix it but they didn’t actually have the parts, also they wouldn’t give me the information of the problem when i said i couldn’t wait a week for them to ship the parts in. I am guessing but it sounds like my pcb board could be the issue also. when you say it is expensive, how much is a PCB from the dealer? However the boiler doesn’t seem to be able to light? Can we manually ignite or is it a case of taking everything apart? Hi Dan, Thanks for documenting the strip down of the Truma. I learned a lott. I just bought a 1996 Hymer B544 and found out that it got a problem with heat water not flowing thru it. Its a Trumatic C3400 . You seams to have good knowledge on these heaters. Do you have any tips on hot water debugging or where you can buy spare parts for these old models? I suspect that the frost gard is somehow blocking the water from entering the heater. Hi Nils – glad you found the info useful! Assuming your water pump is working OK if the frost valve is open you will normally see water coming out underneath your van when you try to draw hot water. I would try unscrewing the valve off the boiler hot water output – if you get water coming out of the boiler where the valve was it is likely the valve is blocked. 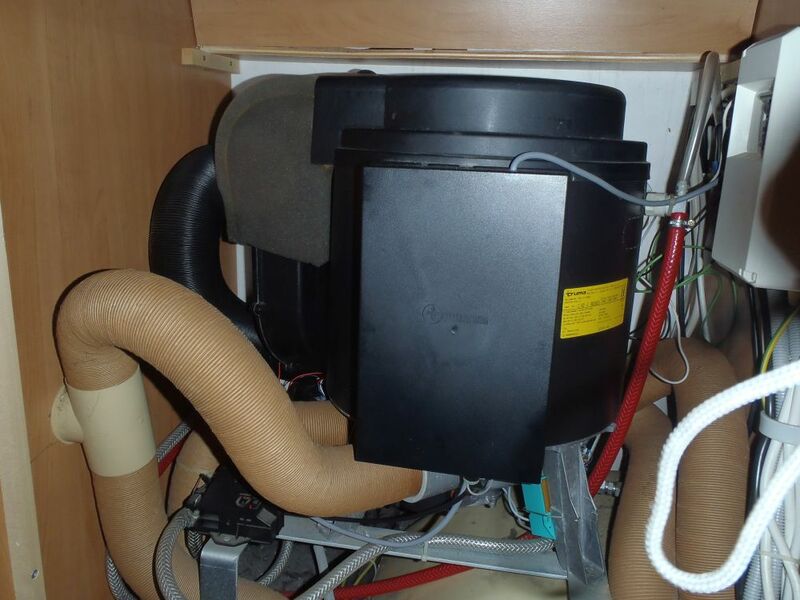 If there is still no flow you could try disconnecting the input hose and blowing through it to see if the boiler itself is blocked – it’s possible it needs descaling but they generally won’t get bad enough to block completely. It could also be that the water pipes are blocked somewhere else in the van – is this is the case you will just have to work your way round disconnecting and blowing through them (with the taps open and the water pump off) to find the blockage. It was the actual truma boiler that was blocket. Somewhere between the frost guard and the boiler. That was why I could not get any water through the hot water tap. I disconnected the frost guard and the pipe between the frost guard and the boler I could se a sluggish paste in the pipe and since no water came flowing back i suspected that there were something blocking the inlett to the boiler. I bought a pipe cleaner for kitchen sinks and pulled it back and forth until the water and bits of gray paste started flowing back from the boilers inlett. I connected the pipe back to the valve and drained the boiler from water. Now I have filled the boiler and freshwater tank with a mixture of citric acid and hot water (500gr pr – 50l ). I have flushed it trough the system and are going to leave it in in the boiler overnight. Tomorrow i will use the valve to empty the boiler the bottom so the deposits of scale will hopefully pour out that way and not clog upp something ells. And if more people have the same problem I hope that this description could help them as much as your tear down helped me. I have a Trumatic C3402 – 2002, ex hire. Boiler works ok but i am getting a high pitched alarm from time to time. It will only go off by switching off leisure battery power. Back on again and its ok – for a while. Ok now. Seems there is no theft alarm on van. I have been through a number of sequences and unable to identify cause. Only came into it after lay up over winter. My guess was that it was to do with a gas alarm, when the boiler did not fire up on first go. Can’t find alarm. Any ideas please? Batteries, both leisure and van are indicating well up, fine. My problem is the noise is so intense, it just seems to be coming from everywhere. I tried the fridge today, hasn’t been gas on for a long time. It took a little, but very little coaxing, to ignite – alarm went off during the process. It resets to off, immediately you turn of and on battery supply on panel. Leading me to suspect some kind of gas leak alarm. There is a hidden spot in upper presses I am going to try to disassemble, to see what’s in it. I will try seperate test on batteries, and have a look behind the Schaudt IT 992 Instrument panel. Thanks for your help, as you might appreciate, it is something I have to nail down before I bed down beside a neighbour! Thanks for that. Eliminated behind controls panel – no buzzer. Eliminated behind boards up in presses – int & ext light relays. Can’t smell gas – but will test for. I’ll have to find that buzzer – it makes so much sound you would think it would be obvious. Thanks again. At floor level – 1mm off – I found a sensor like the head of large screw – pressed it, and off it went. Located gas alarm and siren tucked away behind the leisure battery. Obviously very sensitive and something is setting it off just after ignition. Happy days, and many thanks. The C6002 is a big brother to the C3402, more powerful and has a few extra features I believe, but it works on the same principle. Your symptoms sound interesting, it is normal for the boiler to actuate the second solenoid for extra gas when there is a large room heating demand, this should be the click you hear (which suggests that the solenoid is being actuated OK). If the boiler is repeatedly actuating this is sounds as though it believes it is not working, I’m not sure how it is working this out as at this point the boiler should already be lit (from the first gas solenoid) so the flame sense will already reading as ‘lit’ – adding in the gas from the second solenoid should just make the flame stronger. It is possible there is a temperature sensor somewhere in your boiler that is not detecting the increase in temp it expects? My best guess for the root cause is a blocked solenoid/gas jet – so the solenoid is actuating but no additional gas is flowing. You should be able to remove the solenoid assembly from the side of the boiler for inspection without disturbing too much other stuff. Thanks for the reply Dan, for some reason I didn’t get a notification of your reply and only just seen it. I replaced the main PCB as I managed to “borrow” one. It didn’t solve the problem. I noticed one of the clamps securing the exhaust duct was not the correct type so I have replaced that. But before I put the whole unit back again I have taken out the gas valve and removed the solenoids. You have answered a question I had about the valve in that it is supposed to open another source for the extra gas. I think this is not happening so this is where I am with it. I will probably replace the gas valve. I don’t suppose there is a way to test the valve whilst it’s out of the unit? Dan, I have applied 12 volt to both solenoids, one at a time. And literally blew down the gas inlet pipe of the valve. Both are operating ok and allowing air to pass as each one opens. The only other thing is I am now looking at the burner and in particular the flame rectification probe. It looks much worst than the one on your photo. It looks like it could snap any time now it’s corroded that much. So I suppose I’ll have to change it and see what happens. Again thanks for your help and if you don’t mind I’ll keep posting updates as it might help others. Hi , is the boiler meant to work with the 12v switch on control panel switched off. Mine does and I’m afraid that it might be taking power from the van battery. Help. Thanks for replying Dan . In that case , does it still get its power from the leisure batteries? I’m asking because 3 times now in the last 4 months when we have had a heavy nights usage in the van , dark nights and cold so heater on all night and 7 or 8 hours of tv, and only driving 2-3 miles a day . After the third day our leisure batteries are reading 12.6 v , but the engine battery is 11.4 v. Had to call the AA to get the van going and they put a tester on battery ( only8 months old) and all was good and same for alternator . Hi Dan , the cig to cig jump pack you linked to……does it work , have you tried it? I have a suaoki power pack that should do the job but tried it twice now and it has never worked even though it is always 100% . Thank you so much for all the info and advice . Will get the Draper one . Thanks again . Cheers. Thanks Dan. I am trying to arrange for someone to come and service the unit but this is proving tricky. I am tempted to remove the flue pipe at the boiler end as this will allow me to check the full flue length for blockages as well as check to see if it is fitted correctly. I know you’ve said it may be difficult to reconnect and should have new o-ring. Is it a push fitting with jubilee clip or is there any kind of sealant required? Having had one of these systems in a caravan before the smell is similar to dust being burnt off the elements when the system has not been used for a while. I think first I will get some air duster and attempt to clean the heat exchanger fins from the top. I have also noticed dust on the room fan so I plan to dismantle this part of the housing and clean it. Hi dan, thx for this. Should there be an o-ring at both ends of the flue i.e. side connected to the boat and side connected to heater? I have found an o-ring lose in the heater cabinet! Looks like it most likely came from the side connected to the boat. 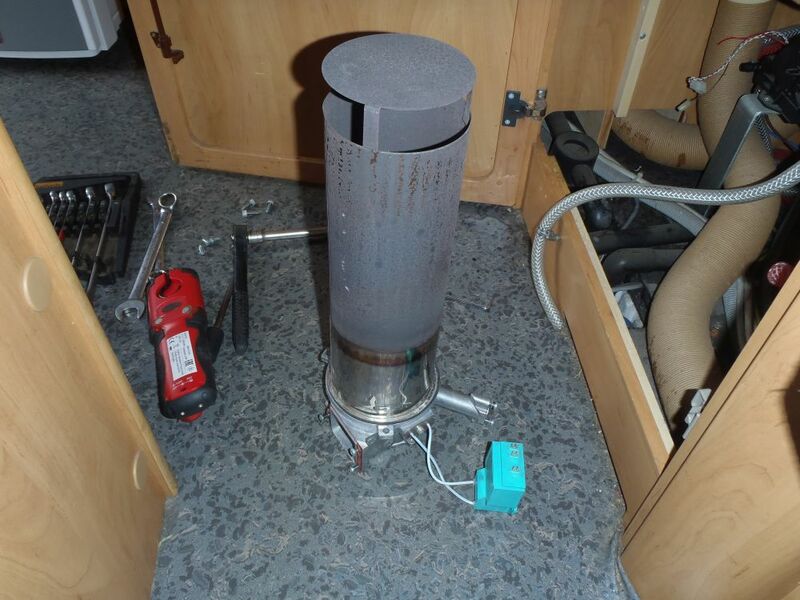 Hi Rich – I’m not 100% sure as I’ve not seen a boat install, but I would expect there to be an o-ring on both ends of the flue…. After lots of faffing I’ve pinned down that smoke is being produced from under the boiler unit. This is most noticeable when the heater is set to high but a burning smell also occurs after a while when just set on water heater. I have checked around the system with a gas analyser and no Carbon monoxide was detected. I’m really confused as to where the smoke is coming from! The unit is very hard to access but I think it will neesd to come out for further checks which is a real pain!